We've got studs on sale! We are not just hewers of wood and we ar e proud to complete the cycle by participating in silviculture activities in the Lac Seul Forest through our sister organization, Obishikokaang Resources Corporation (ORC). Obishikokaang Resources Corporation was established in 2012, by Chief and Council to manage the Lac Seul Forest and to provide economic development opportunities for the Lac Seul First Nation. 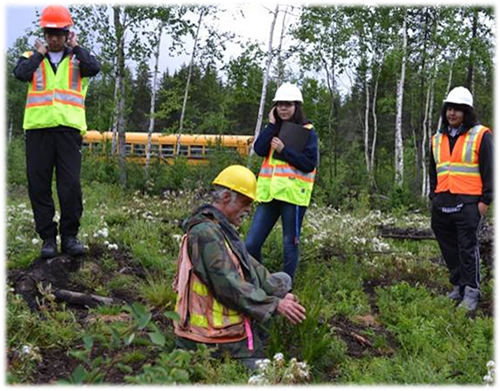 Since that time, Obishikokaang Resources has proven itself to be an effective and successful forest manager, working closely with all stakeholders on the forest, including the communities of Lac Seul First Nation, Hudson and Sioux Lookout. Since 2012, ORC has managed the Lac Seul Forest. Obishikokaang Resources has increased the flow of fiber from the forest, reduced forest management costs and remains a financially independent company. ORC oversees planning, harvesting, siviculture, (seeding, planting, tending) and road building, while protecting culturally sensitive values, instilling traditional knowledge, conserving animals habitats and maintaining our renewable resources in an environmental and economical way in partnership with LSFN.